Richard is New Zealand born but moved with wife Annie to Australia in 1996 at which time found The Pooch Mobile Dog Wash. After 21 years of washing dogs, Richard stills enjoys going out to work each day to meet his four-legged, happy tail wagging friends. Richard has a Rottweiler named Mishka and a Doberman named Kupa. I look forward to meeting and taking care of your pooch in the Henderson and Las Vegas areas. To book an appointment for your pooch, please contact Richard directly at 702-370-4542 or complete the form below. 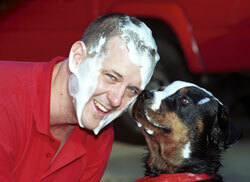 Richard does not offer style cuts or shave downs, his specialty is dog washing. All breeds welcome.